Whether it's a ‘Stay-cation' or a week-end destination New York City offers a spectacular array of pet-friendly activities, restaurants and resources! In this edition Janine Franceschi and her Irish Setter Beau, noted pet travel experts share their favorite Wag-Worthy West-Side Wonders! Finding a pet-friendly bite to eat on the West Side is a day at the beach...or the boat basin as the case may be! Visit The Boat Basin Café at West 79th and the Hudson River (open through the end of October, weather permitting). Without a doubt go for dinner at sunset, it is absolutely gorgeous! Your well behaved, leashed pet is welcome to accompany you while you dine outside. You can choose from the selection of grilled specialties and your pup is sure to enjoy a cool bowl of water and lots of attention from guests and staff alike. Before you head down to the Boat Basin Café, make a stop at the gourmet ‘barkery' Furry Paws at 141 Amsterdam Avenue, (212) 724-9321 to pick up an after-dinner a-purr-a tife. This pet specialty shop offers high-end pet treats that are delectable to dogs! While you are in the neighborhood don't miss stopping by one of the Canine Country Club locations at 452A Columbus Ave or 105 West 72nd. Here you will find a one-stop-shop for everything pup! It's the perfect place to pick up a new outfit for your pups Boat Basin debut! After dinner you can work off the calories, or you can always go before-hand to work up an appetite, but either way you'll want to make a stop at Dog Hill - Central Park. Dog Hill is accessed through the West 79th St. entrance to Central Park and you're surely guaranteed to find pups for your furry friend to run and play with. A great resource for Central Park Dog rules can be found at Central Park Paws. Then when you're ready to lay down your (dog-tired) head return to your sublimely perfect room at the pet-friendly Mandarin Oriental Hotel atop the spectacular Time Warner Center at Columbus Circle. The Mandarin Oriental welcomes pet guests of all sizes without imposing any additional fees. Once you've made your reservation simply call the hotel with your confirmation number and tell them about the pet that will be accompanying you. The guest services staff will create a pet-welcome amenity based upon your pet’s size, breed, and preferences. 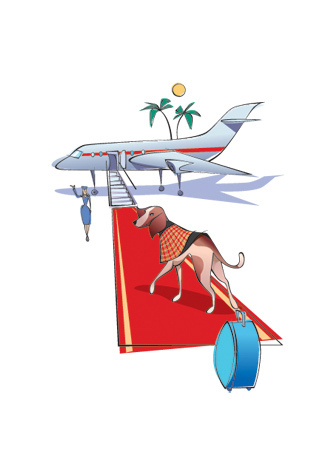 Each sumptuous pet welcome amenity is custom crafted and guaranteed to produce squeals of delight from both you and your furry traveling companion! To find more information on what you can do with your pet in New York City visit PAW; Pet-friendly Accommodations Worldwide. PAW is the only online pet-friendly booking engine to exclusively offer luxury, (3-star or higher rated) pet-friendly hotels for booking. PAW also features a 'Canine Concierge' page where you can find all the best pet-friendly restaurants, activities, and resources by city. Watch your email for more Travel Kibble in the coming weeks when we share Wag Worthy East-Side Spots for Spot! Let Us Know: In upcoming emails we will be featuring some tasty Travel Kibble. Drop us a note and tell us where in the world would you like to be able to vacation with your pet? Janine Franceschi, and her 3 year old Irish Setter Beau have driven 20,000 miles, visited 30 states, and stayed in hundreds of luxury pet-friendly hotels around the country! Searching for pet-friendly excellence in hotels, activities, restaurants and resources, together they source and review luxury pet-friendly hotels for PAW; Pet-friendly Accommodations Worldwide, the only online pet-friendly hotel booking engine to exclusively focus on luxury, (3-star or higher rated) pet-friendly hotels.